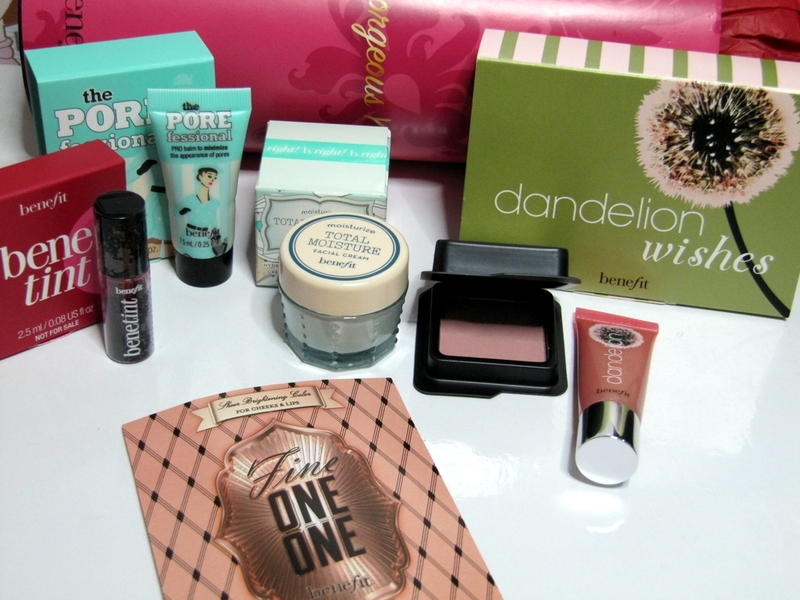 The middle of the month has rolled around already and that means that my December Topbox has arrived. After November‘s amazing Topbox, I was so excited this time, I started ripping off the paper in the elevator, I couldn’t even wait to get up to our apartment. I was pretty surprised to see it in my mail box when I got home from work, considering the boxes shipped out Thursday and it was in my mail box on Friday. 🙂 Thank you Canada Post! Unfortunately though, that is where my “thank you’s” end. 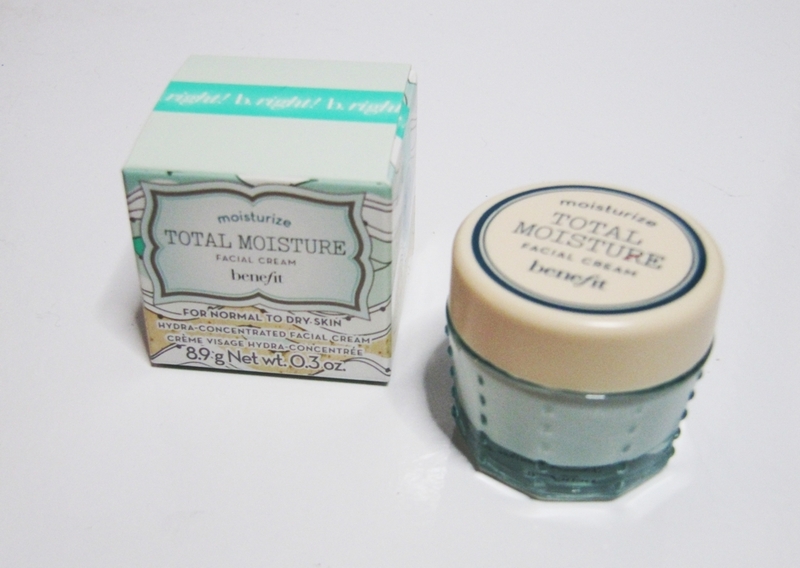 I was disappointed with sample after sample from this month’s Topbox…and I will tell you why I’m particularly irritated this month. Let me start by sharing a little bit of background. Being a Topbox subscriber, you have the opportunity to fill out survey’s every month so Topbox can better personalize your box for you. I think this is an incredible feature and is the main reason I signed up for Topbox in the first place. 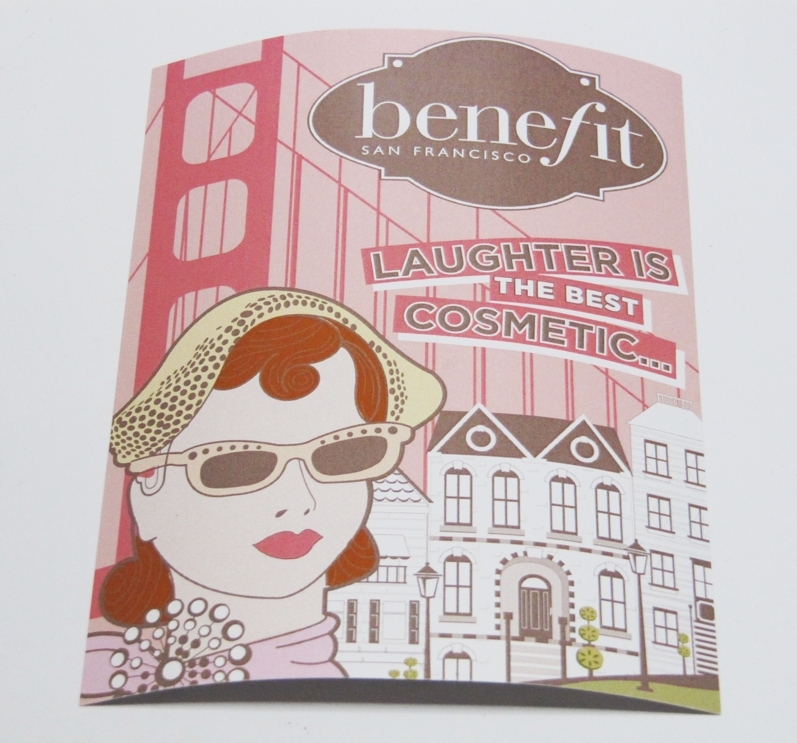 So you have your standard beauty profile in your account, which is very limited and only consists of about 6 questions. But, every month, about two weeks after your last Topbox, they email you a survey to help them personalize the next month’s box for you. December’s survey featured a few different questions, two of which I remember the jist of quite clearly. One asked if I was suffering from acne breakouts recently. I answered “no”. The other question I remember pertained to how often I blow dry my hair. My answer would’ve been “very rarely” or “close to never”. I think the last time I blow dried my hair has to be close to 9 months or a year ago. I have hair almost to the small of my back that dries bone straight, so my blow dryer sits in a rarely opened drawer. If my other two samples had been incredible, I probably wouldn’t have cared so much, but I received another perfume sample…..and a small pigment sample (equivalent to the sizes you can get from MAC or Sephora for free just by asking). So this month was a complete and utter disappointment for me. The packaging was cute for the holiday season, but that is where my excitement ended. Dosage: Apply a pea size amount twice daily to affected areas or as directed by physician. Fair skinned individuals should begin with one application. 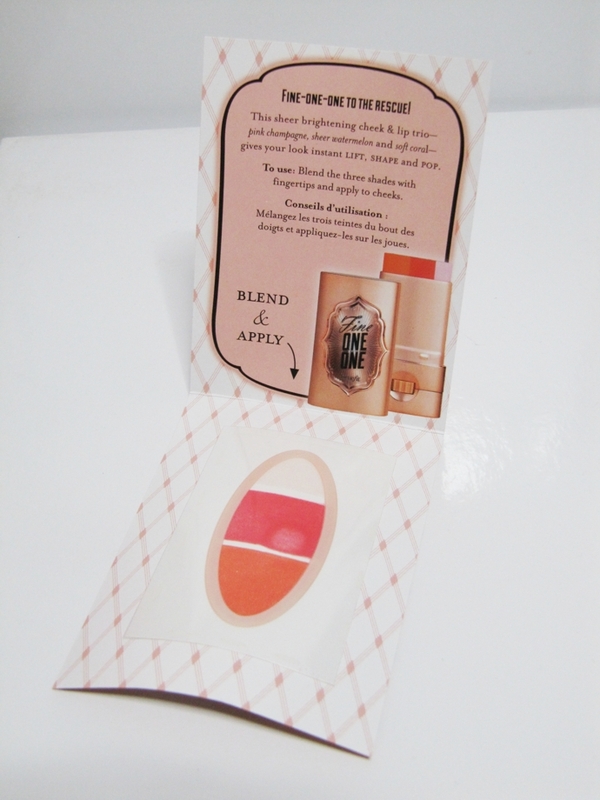 I personally hate these types of packaging for samples, because there is too much product for just one use, but there is no way to reseal them after you’ve opened them. So it takes some effort to ensure they don’t spill all over the place or dry out before you can even finish trying them out. 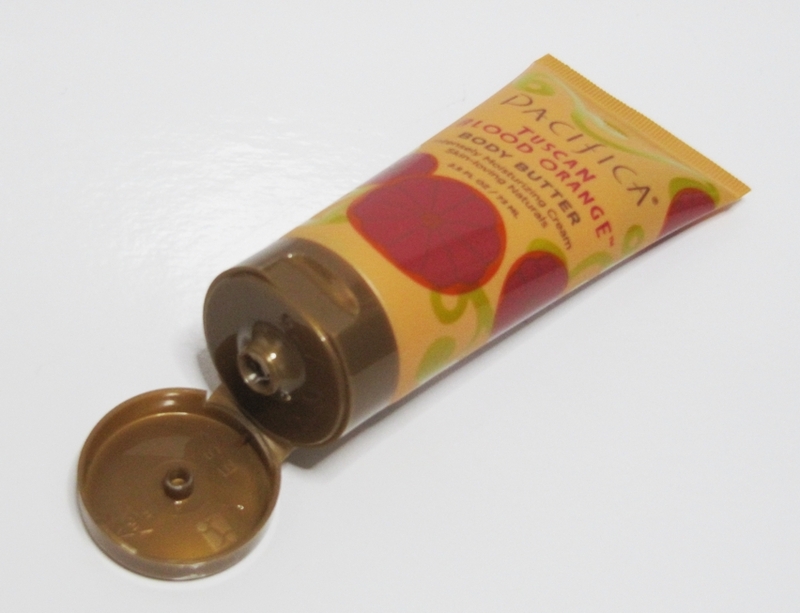 I really think it would’ve been great if the samples were instead in a mini bottle or tube. These two packets are 3mL each, for a total of 6mL. 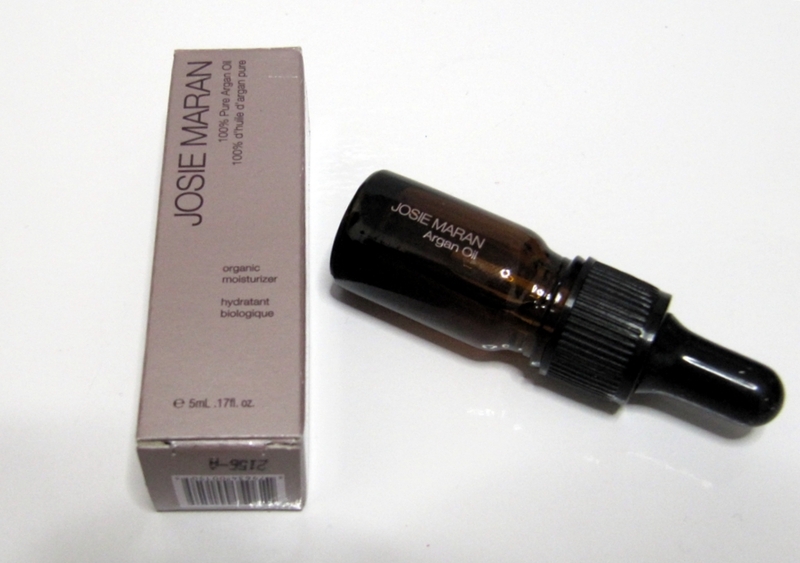 The full size bottle available for retail sale is 50mL and costs $75.00. 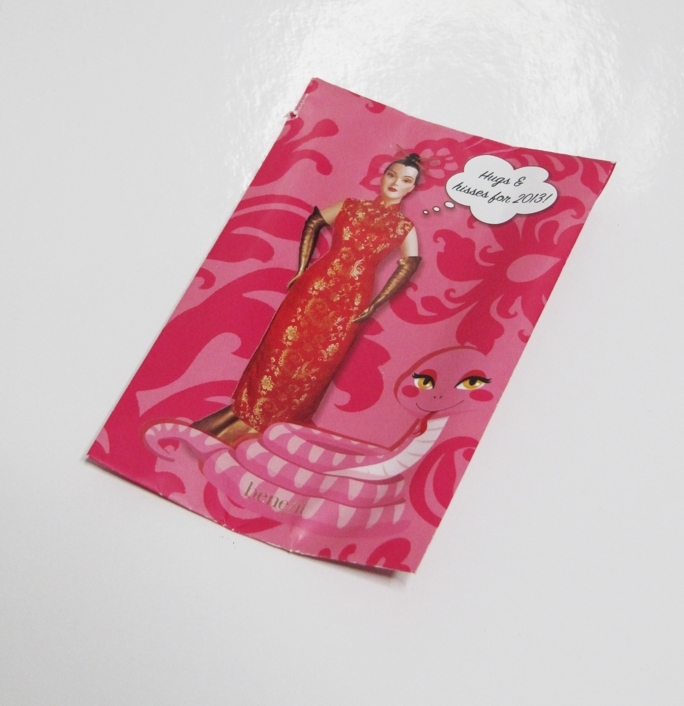 This sample is valued at a total of $9.00. 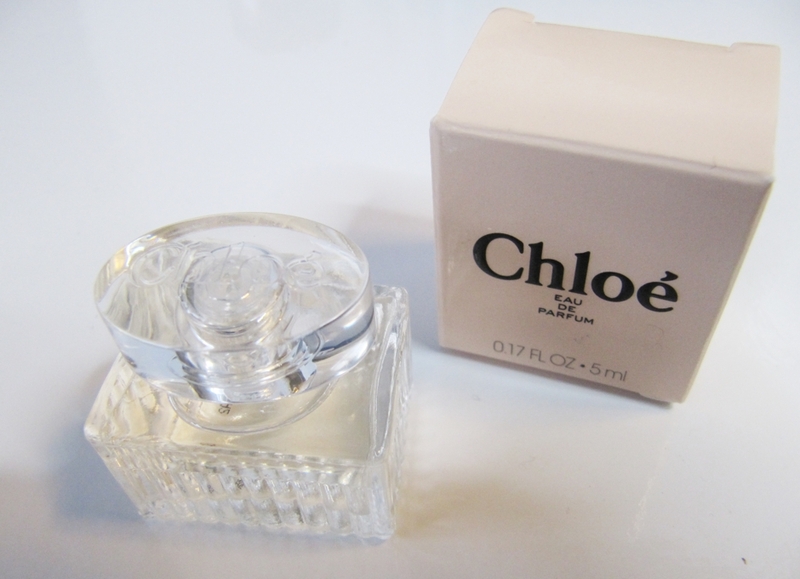 This perfume sample comes in the cutest little bottle and though it is hard to see in the picture “Chloé” is etched on the top plug which is an adorable touch. The scent itself is a strong floral, rose scent that smells very fresh and sophisticated. It in no way smells cheap or “old ladyish”. 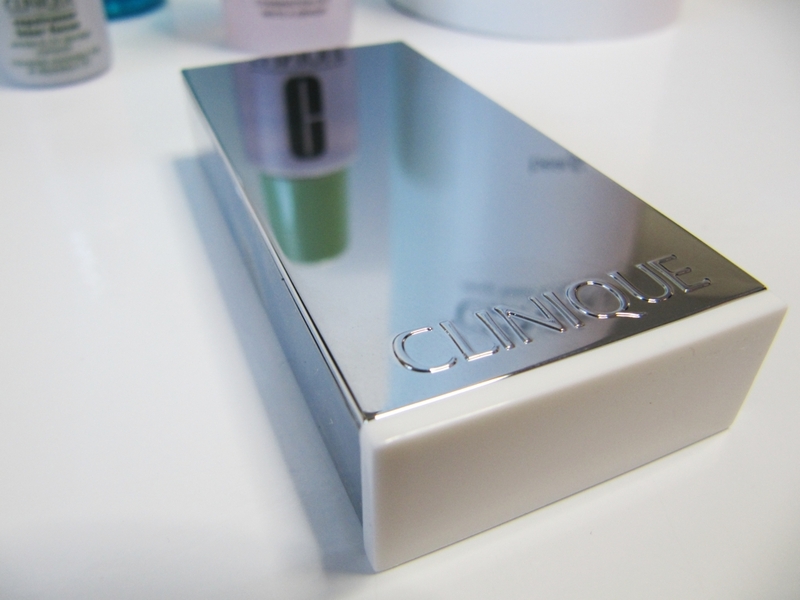 It seems to be quite long-lasting in my first experience with it and is quite elegant and classy. So although I wasn’t at all wanting another perfume sample, this one is lovely. I just hope I don’t get any more for a few months because my stock pile of perfume samples is growing too large and I can’t keep up! The full size version of this perfume is 50ML and retails for $90.00. 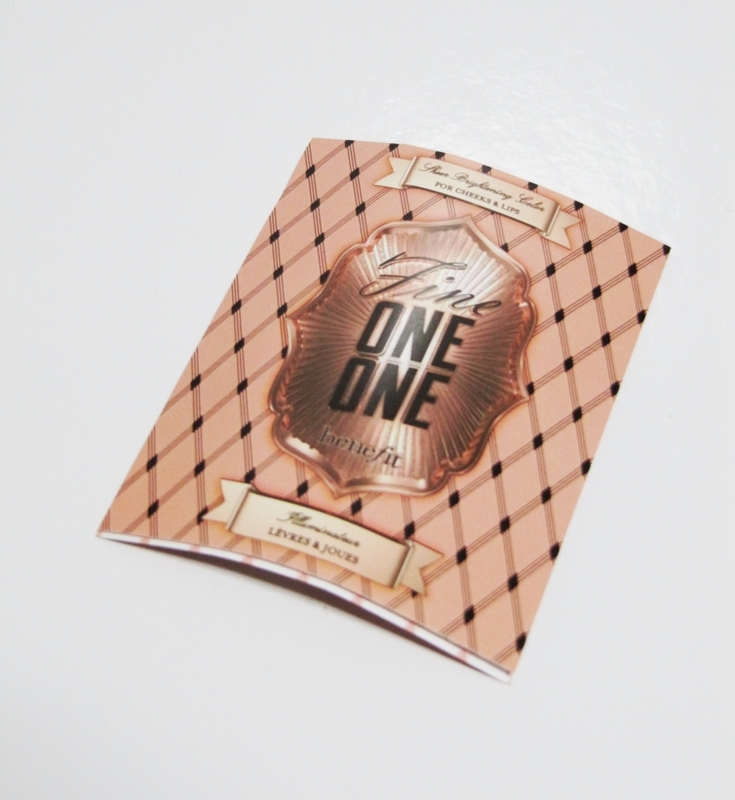 That means this 5mL sample of perfume is valued at $9.00. 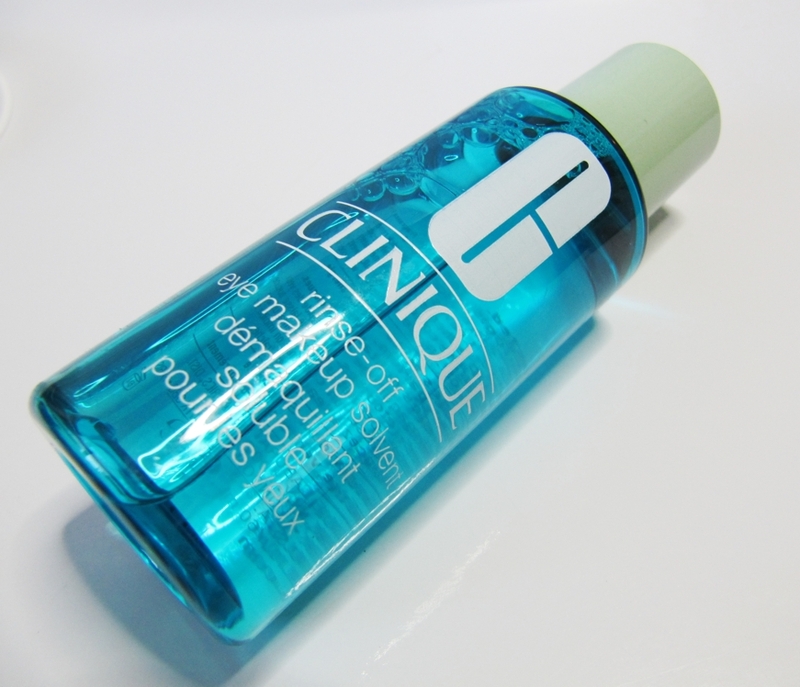 Easy-to-use spray gel for creating instant body and texture. Directions: Spray onto towel-dried hair and finger style. 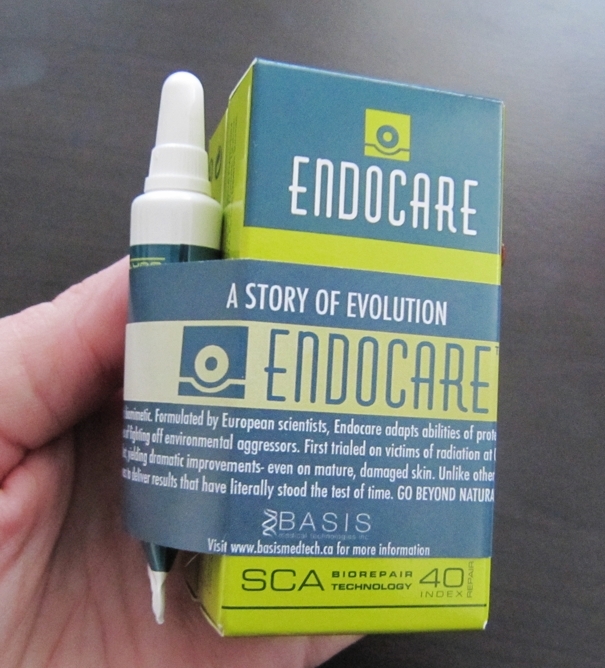 Full size bottles (150mL) retail for $18.95, making this 30mL sample valued at $3.79. 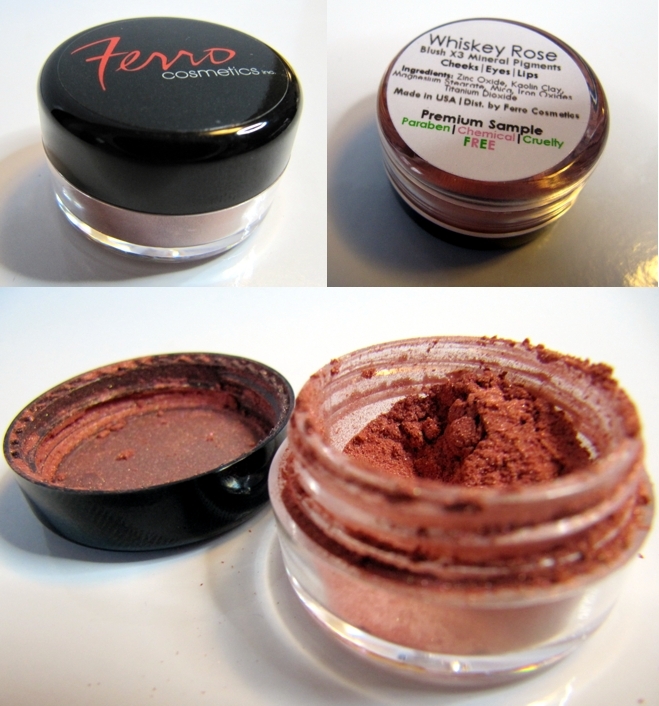 Ferro Cosmetics is a brand founded by Celebrity Makeup Artist Krissy Ferro. 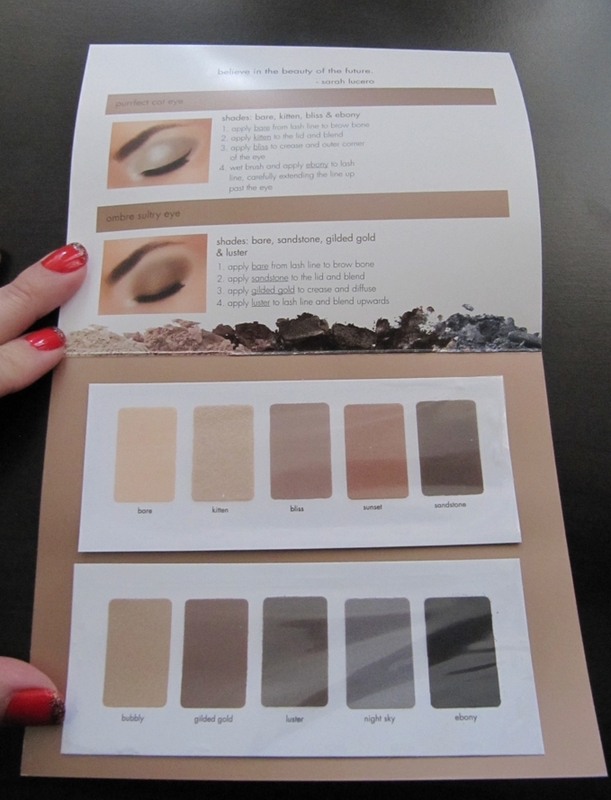 They make 100% natural mineral makeup. Their Blush x 3 line of mineral pigments are multi-purpose pure mineral pigments that can be used on the cheeks, eyes or lips. Advertised as saying “every shade matches every skin tone”. The packaging of this sample is a nightmare. 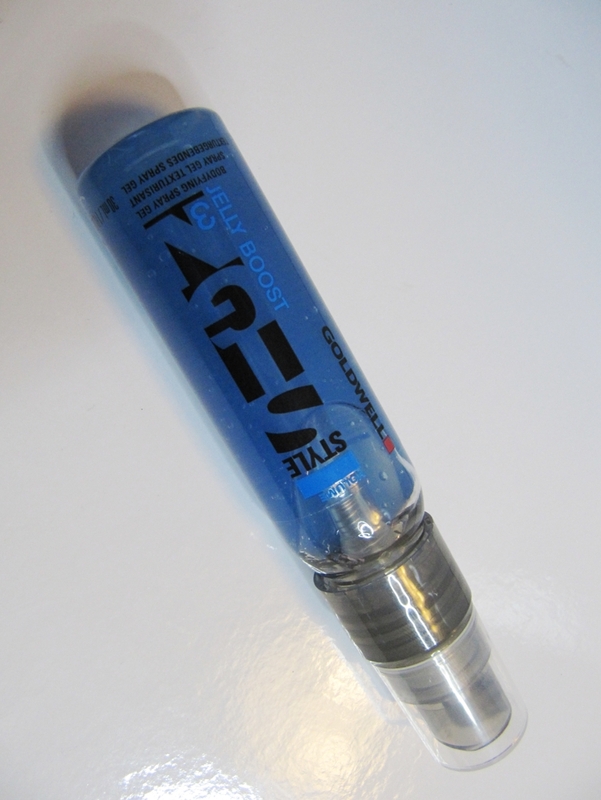 Because there is no plastic cover or anything inside the vial, the pigment gets everywhere. So as soon as you open it, it spills all over and as soon as you close it the same thing happens – it gets all over your hands and everywhere else in close vicinity. 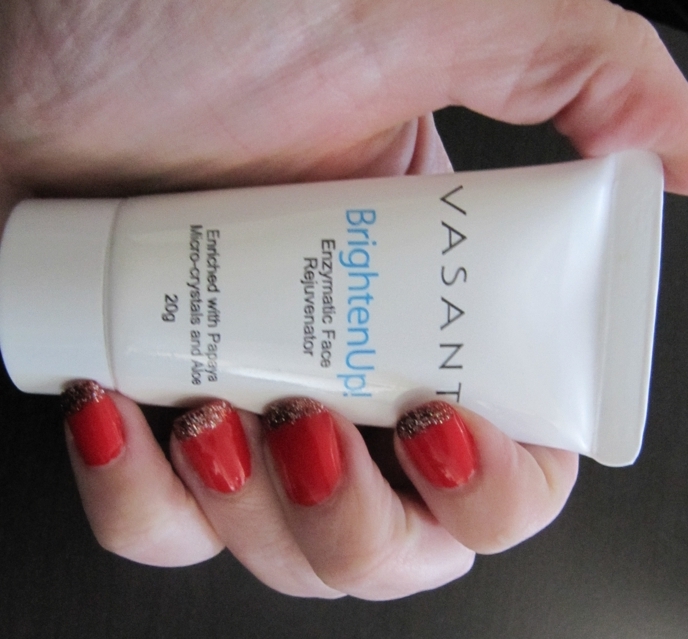 To give you an idea of sample size, it is the very close to the same size you would receive at a MAC store or counter. 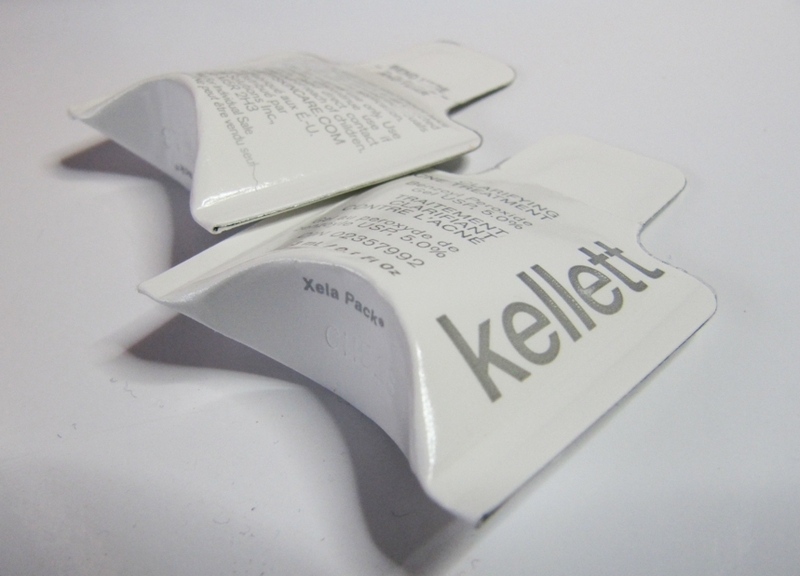 Except the MAC vials have a much better seal and don’t spill all over the place. 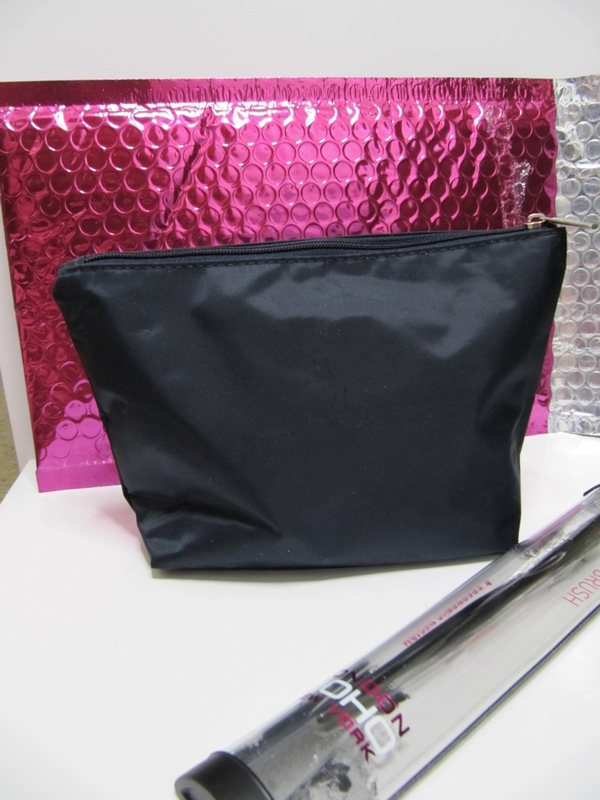 It was hard to find a value of this sample because there is no measurement of weight or contents on either the sample or the full size products (retails for $17.00) on the Ferro Cosmetics website. They do however have samples of other products available for sale on-line, so I can estimate that this sample’s actual value is somewhere between $3-4 dollars. That makes 2 out of 3 boxes from Topbox complete misses for me. I was really disappointed that my December survey responses were ignored. I only have one or two more Topboxes in me, before I cancel my subscription. I really hope January’s box is better! 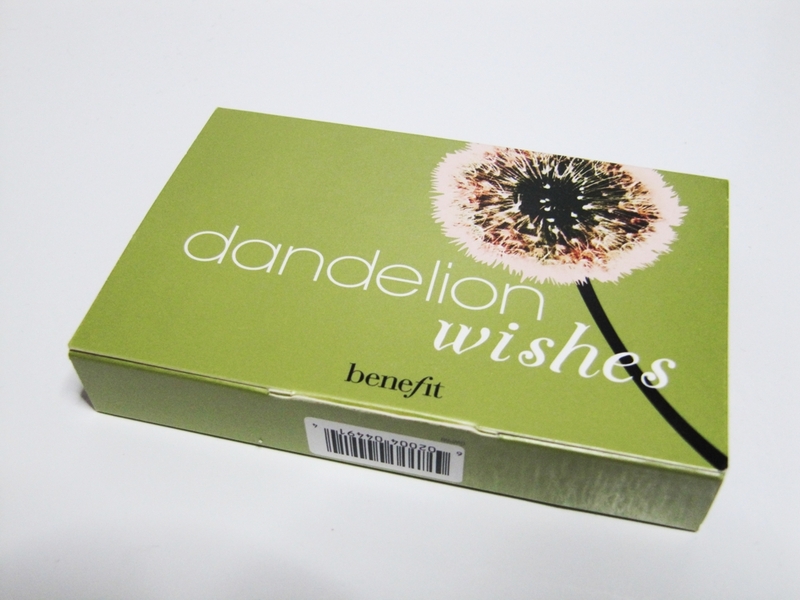 What did you receive in your beauty box(s) this month? 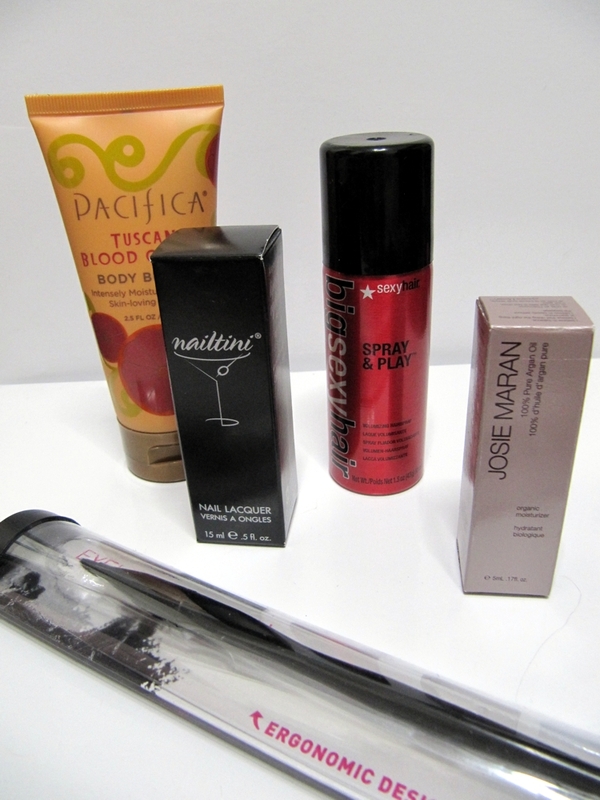 Does anyone have a suggestion for another Canadian Beauty Box that I might like better? I’m curious about Loose Buttons, Glymm and Glossybox. 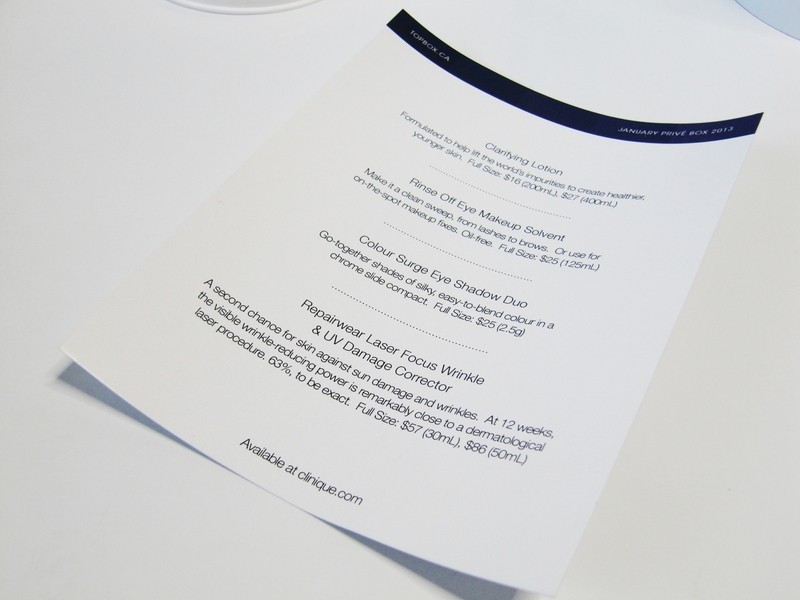 If you are a subscriber of any of those, I’d love to hear if you are happy with the service! Please leave a comment below or send me an email. 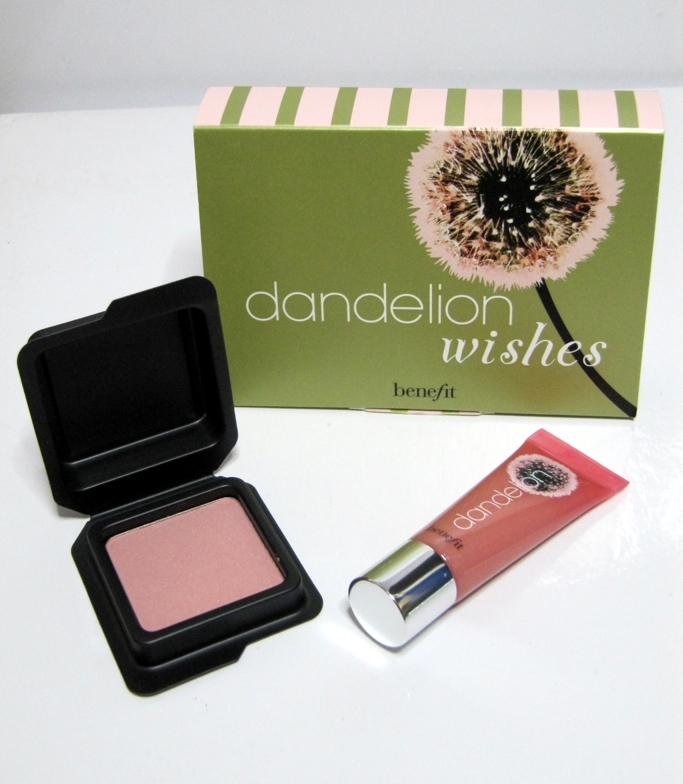 After receiving my first Topbox last month and being a little disappointed, I wasn’t sure what to expect for this month. Topbox customer service had assured everyone that it was going to be a great month, but I still didn’t want to get too excited in case I was setting myself up for a let down. My husband was watching “Rumble in the Bronx” (an absolutely terrible Jackie Chan movie) in the living room in the dark, so I snuck in beside him on the sofa to open up my Topbox. It felt very dramatic, because I couldn’t see anything when I pulled the cap off. I reached in, pulled out my first item and………..was so freaking excited! My first item was a deluxe perfume sample of Vera Wang’s “Lovestruck”. 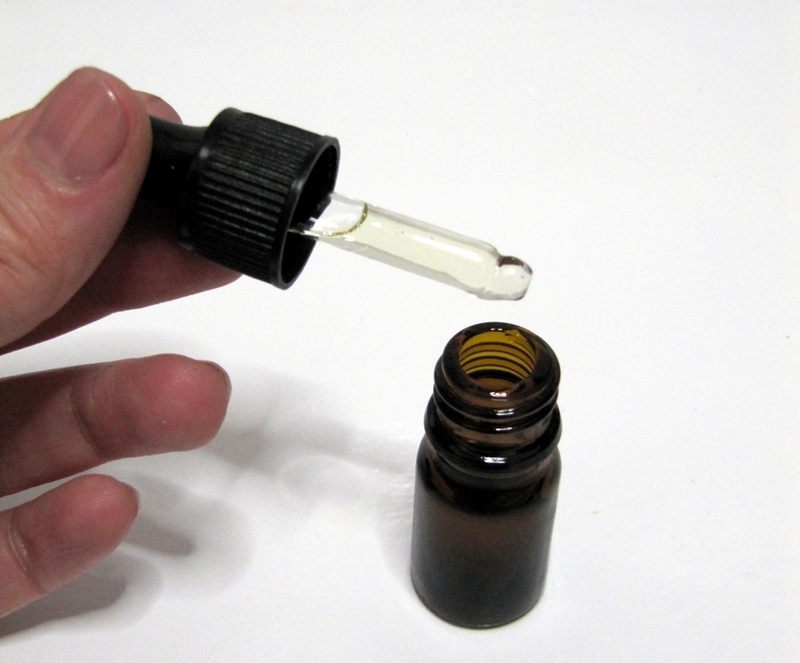 At 4ml this generous sample is the perfect size. I honestly never buy perfume because the bottles are so large and take absolutely forever to use up, I just can’t stand the same overpowering scent everyday. So I always love receiving perfume samples because I can keep variety in my life and never get tired of a certain fragrance. Lovestruck Floral Rush is a mainly floral scent, with soft hints of fruit and musk. 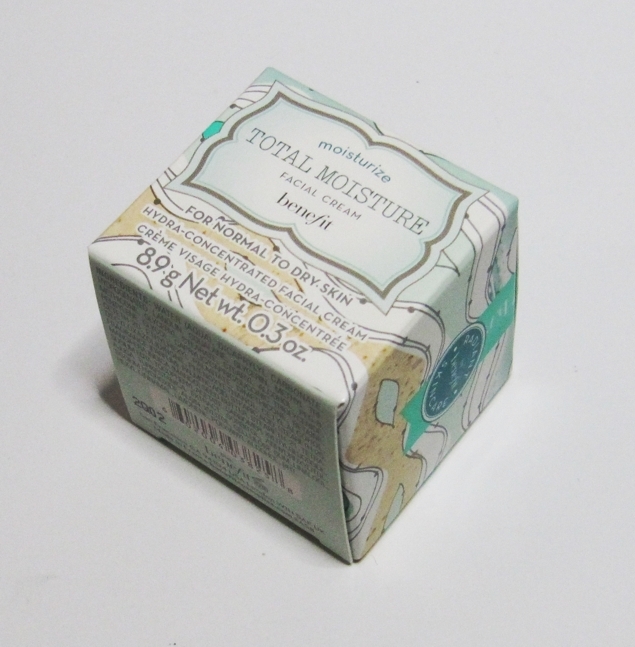 The 50ml full size of this product sells for $79.00, meaning this sample is valued at $6.32. WIN! I stuck my hand back inside and felt around….and thought to myself “is that a full-size nail polish?! ?” as I pulled out “I’m Not Lion” from China Glaze’s On Safari Collection. I was SO stoked about this. There were two shades that I was really sad about missing out on from this collection this past fall. 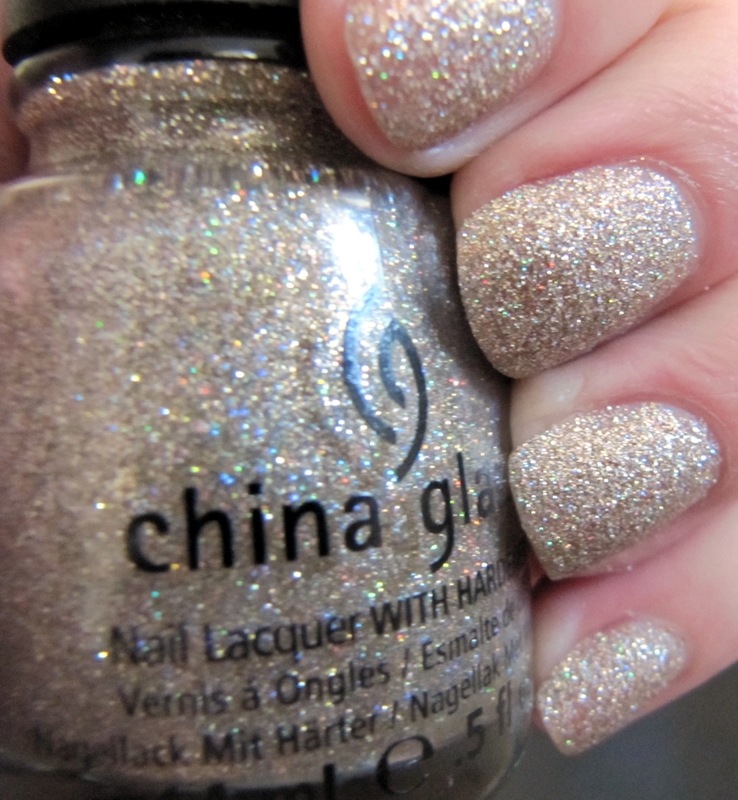 One being Exotic Encounter (a jade creme) and I’m Not Lion, this stunning glitter! I immediately started applying this one and ever since have been staring at the pretty glitter. 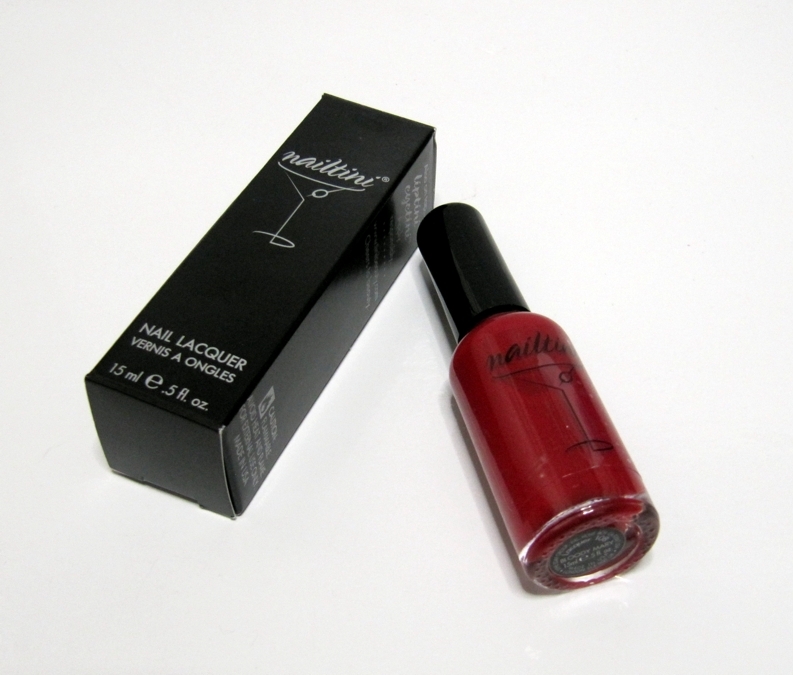 China Glaze nail lacquers sell at salons for $8.00-$12.00, but you can pick them up at Sally Beauty Supply stores for about $5-$6. 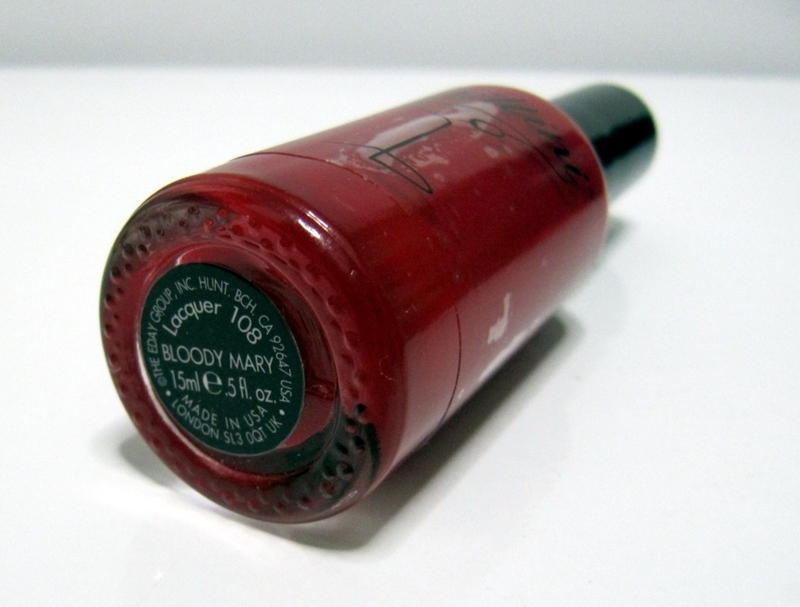 This polish however was limited edition and the best place to track it down now would be on Ebay if you are trying to find it. WIN! 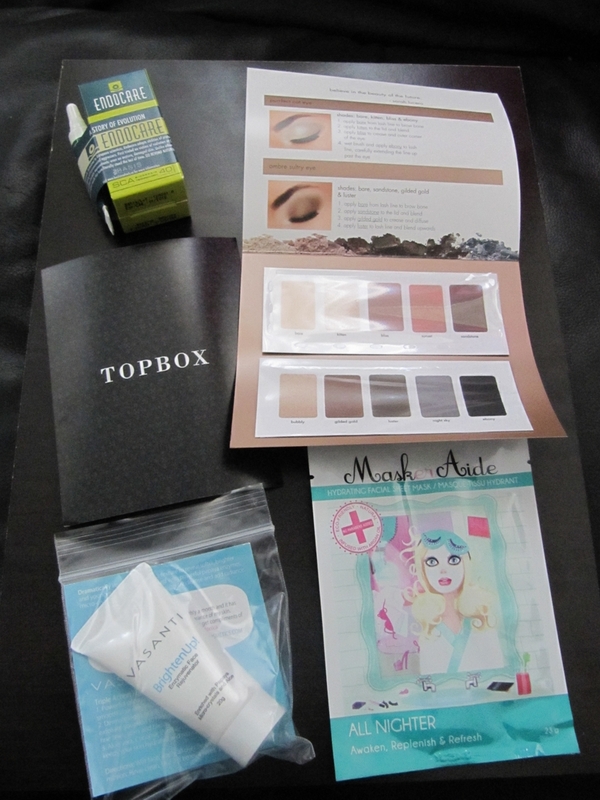 At this point, I already felt like my Topbox was a winner, regardless of the next two items. But I dove back in and was graced with another amazing item. 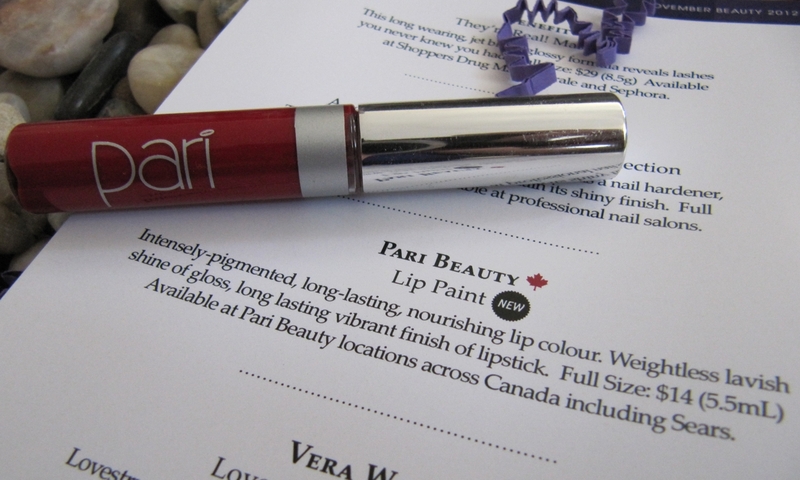 Out came a Pari Beauty Lip Paint in shade “Red”. 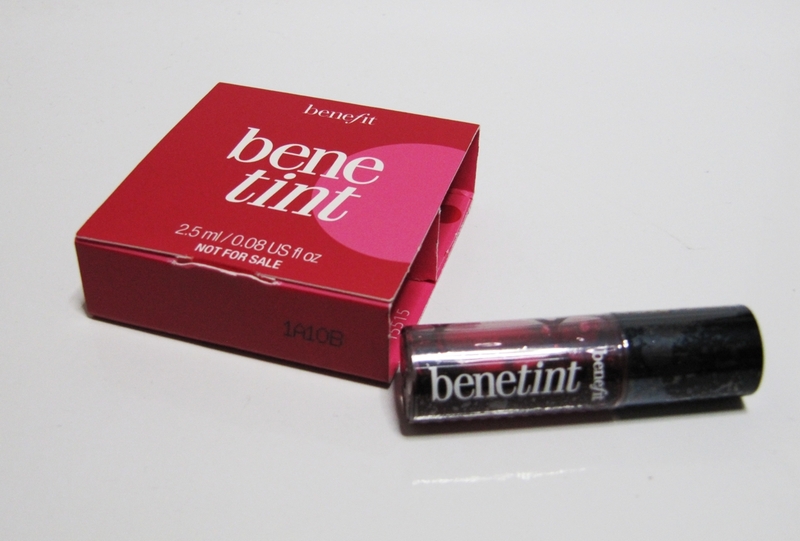 At 4ml, this is almost full size (5.5ml for $14), which makes this sample valued at $10.18. 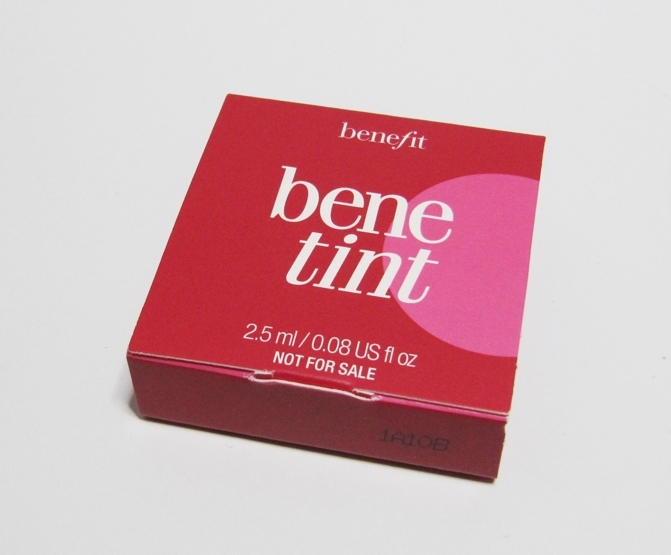 I was excited to give this shade a go and see what the formula was like as I’ve never tried any of their products before. So the day after receiving it, I promptly tried it out. 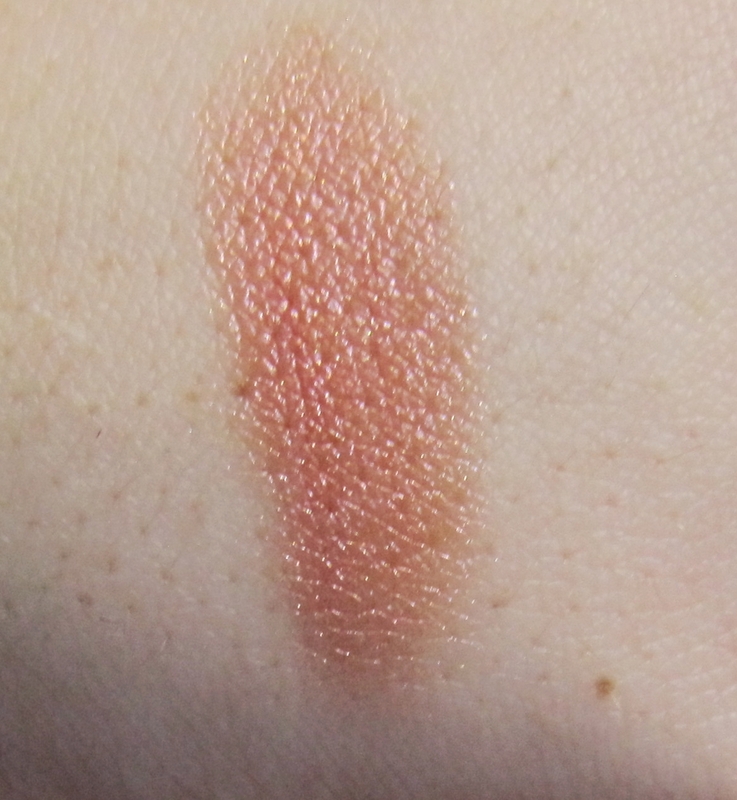 It went on creamy with great pigmentation and then proceeded to persist through my meals and look fabulous – no splotchy or patchy wear as the day went on. We are talking, I didn’t even need to touch up after lunch…ummmn what? AND it didn’t feel at all drying, which is a huge accomplishment this time of year when my lips tend to dry out very easily! BIG WIN! For my last item, I was sure it was going to be a dud. But NO! 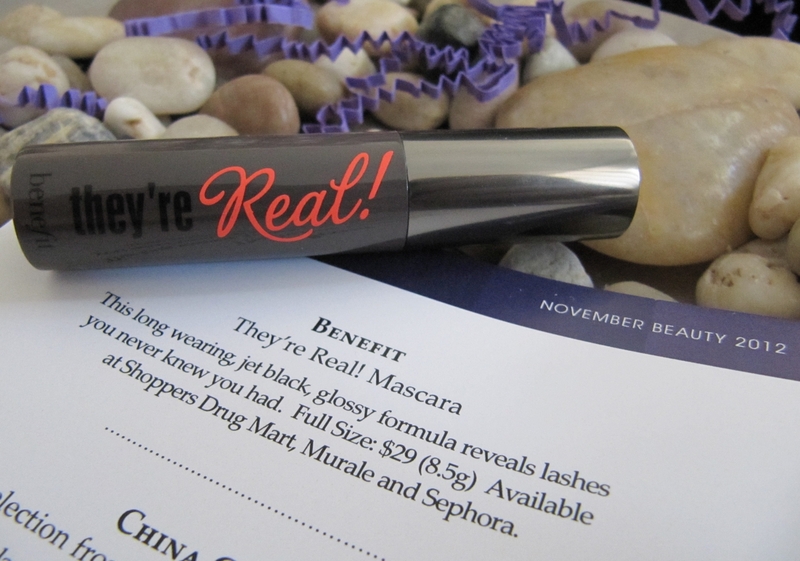 I was pleasantly surprised with a good sized mascara sample of “They’re Real!” by benefit. 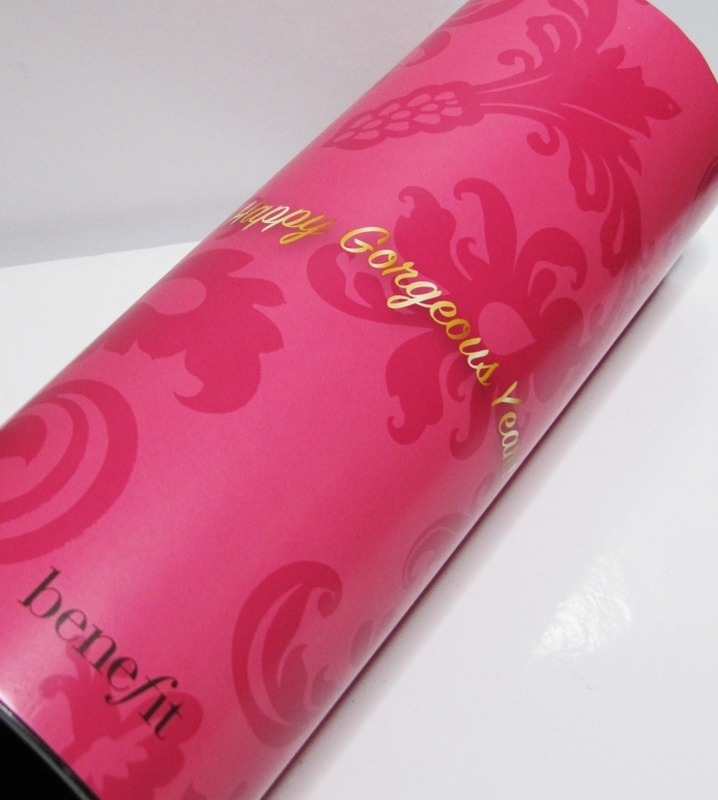 I already have and love this mascara (follow this link for before and after pictures), so I will likely use it for an upcoming give-away But I still absolutely love that it was something I knew would be put to good use and is a product I’m happy to have. 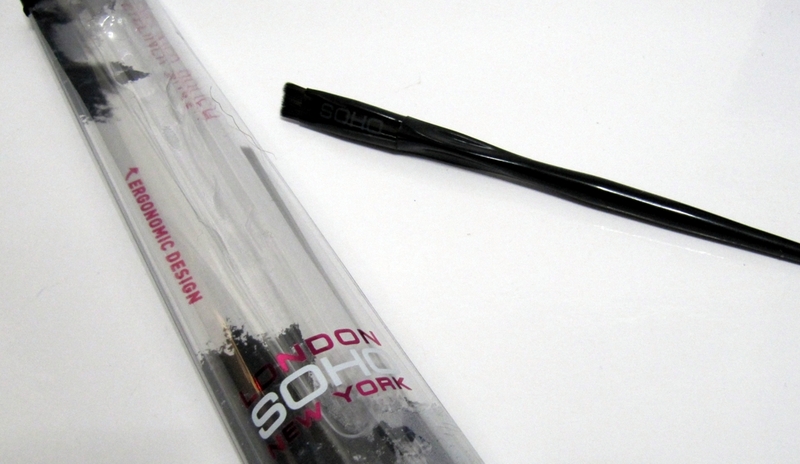 With the full size mascaras retailing for $29.00 this makes the value of this sample a whopping $9.67. WIN! So if I total everything up, that means my samples are valued at about $32.00. This Topbox only cost me $10.00 plus taxes. Are you freaking kidding me? What a great deal! Thank you TOPBOX! Given this amazing box I received for November 2012, I was definitely curious to see what other people got in their boxes and as I started snooping around, I was shocked to see so much variety. Completely different items. 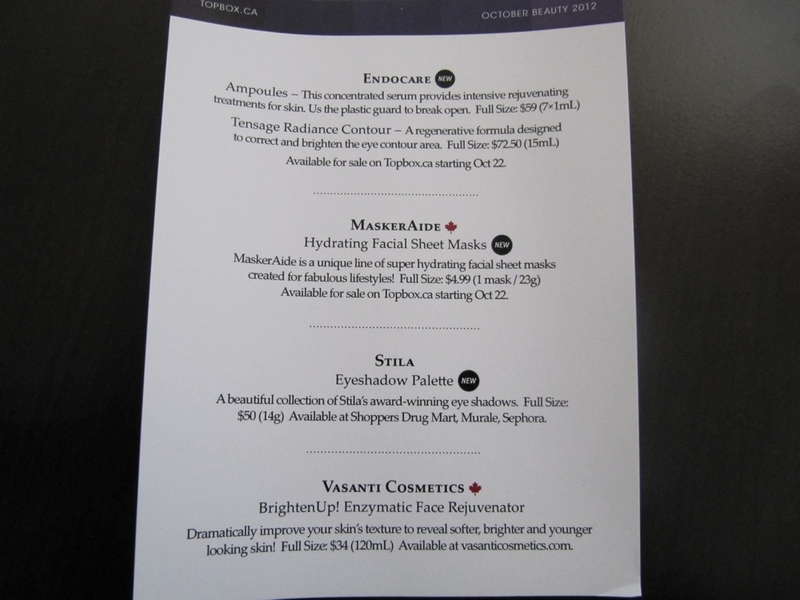 Looks like they really tailored the items to the individual’s beauty profile this month. My box was labelled “Box 21” meaning there were at least 21 different boxes going out and there could’ve been more. I really think that is fantastic! Please note: Starting December 2012, they are increasing their price to $12.00 plus taxes (shipping is still free). I want you all to know that I feel no bitterness surrounding this price increase. When they started out a year ago, they only had products from 6 brands, now they have working relationships with over 40. Their customer service is fantastic too! They are quick to respond to your inquiries and are continually seeking feedback so they can make sure they are going in the right direction. 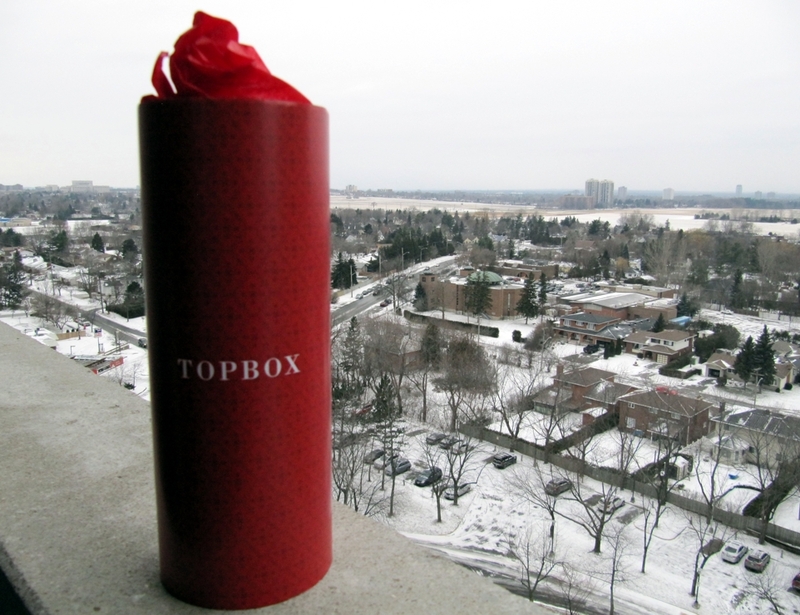 If you are interested in becoming a Topbox subscriber, you can join the waiting list here. Hope you guys found this interesting! And if you are one of my Canadian readers and are trying to decide whether you should sign up or not, leave your questions/concerns below and I will answer them to the best of my ability and try to help you get off the fence. 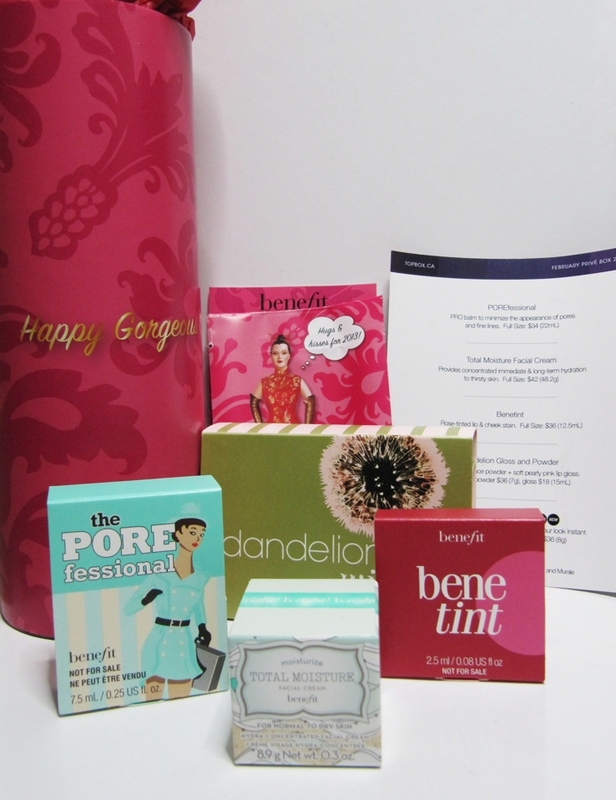 If you are already a subscriber of Topbox beauty boxes, let me know how this compares to your beauty box and what you thought of Topbox November 2012! 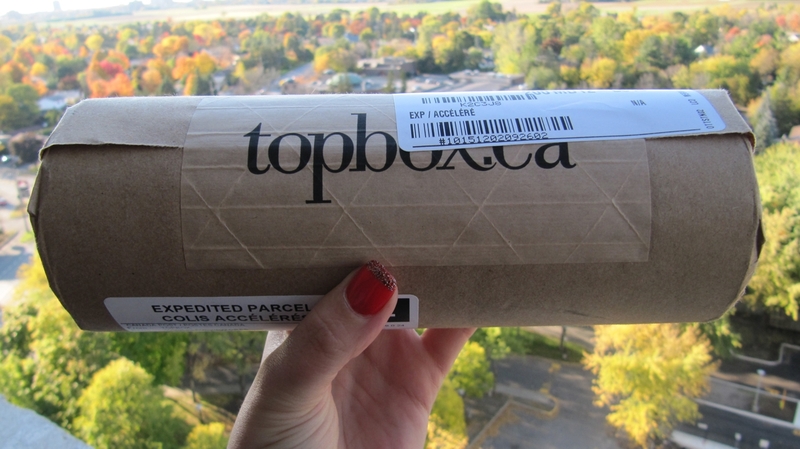 Topbox is a Canadian beauty box where you spend $10/month and they mail beauty samples to your door. 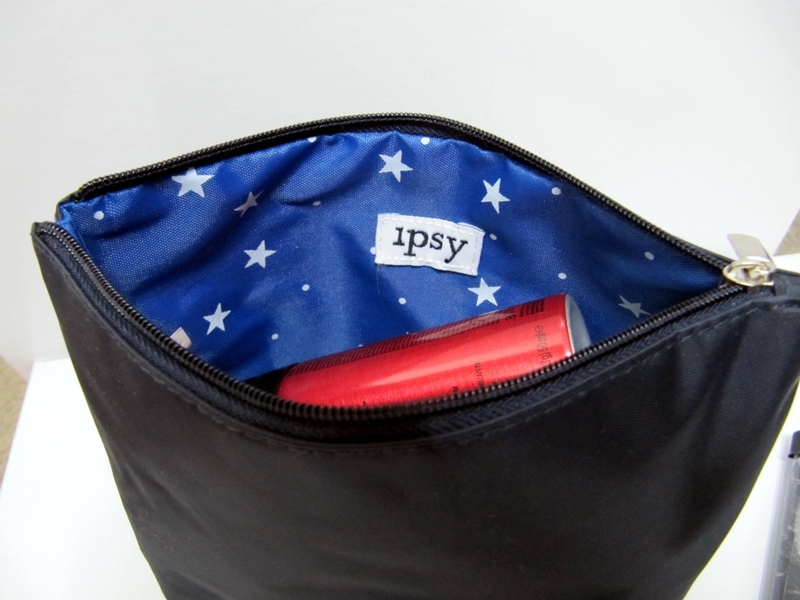 Shipping is included (taxes are extra) and you can have your beautiful little package shipped anywhere you like. Your subscription automatically renews on a month to month basis, so as long as you are happy with it they will continue to send you little “presents” every month. I’m not sure about you guys, but I absolutely LOVE getting mail…and packages are the BEST kind of mail. It makes me so happy when a little box filled with fun beauty products arrives…which is even cooler when you have no idea what to expect. …just to name a few! For a complete list, check out their website here. What is also great is that they even offer discounts on full size products from these brands as well. So if after you’ve tried out a sample and you are absolutely in love with it, you should be able to pick up the full-size at a good price. How do I get a Topbox? The big draw back? Topbox has a waiting list of several months. I signed up middle of April and am just now getting my first box now, in October. So, my recommendation is, if this interests you at all, go ahead and sign up (you don’t pay anything now) and if you change your mind by the time you reach the top of the list, you can just withdraw, easy as that. They don’t start your subscription until you confirm you’d like to proceed. If you want to sign up, you can join here on their website simply by using an email address and creating a password. It will show as “sold out” but you will get an email telling you that you have joined the waiting list. 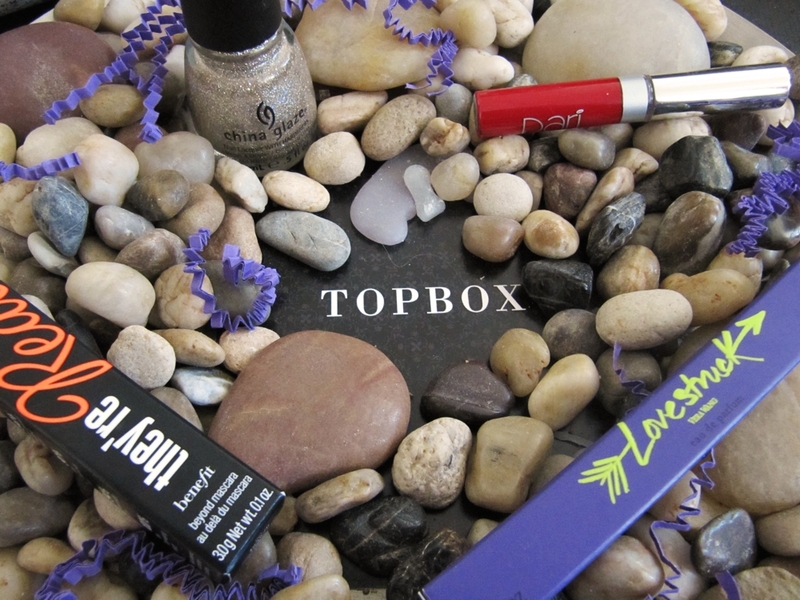 Then you can check out what I am receiving every month and decide if Topbox is for you. Where does my Topbox ship from? How is it shipped? 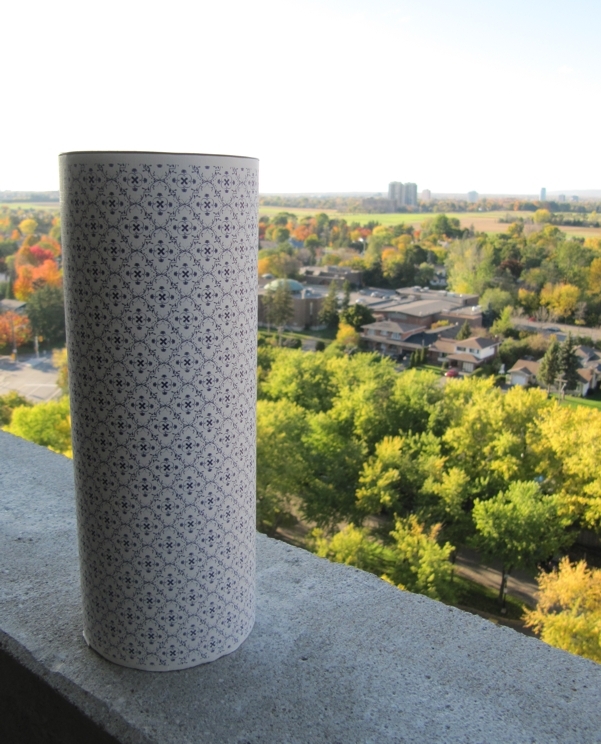 Topboxes ship from the Toronto area via Canada Post, so if you are located in Ontario you should receive your Topbox in 2-3 days, but if you are on the west coast, you could be waiting up to 5 business days. They are a cylindrical box wrapped in brown paper. 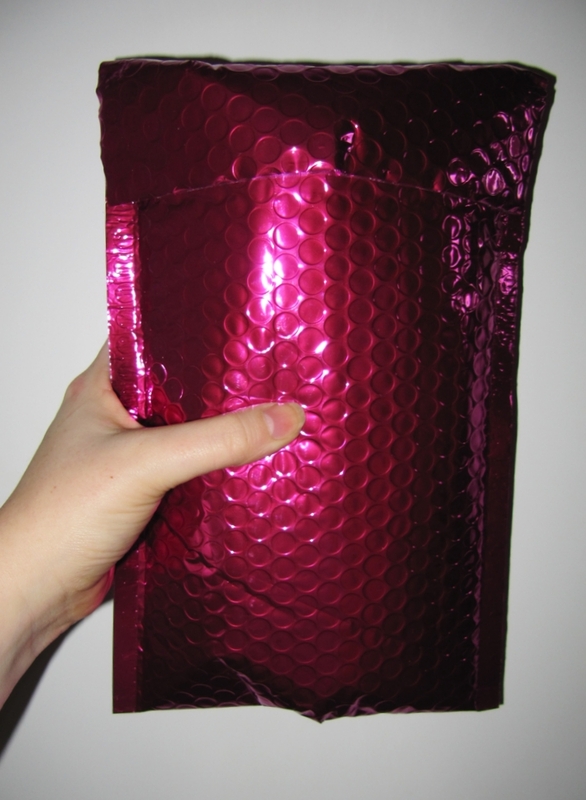 The packages are small enough that they fit right in your little mail slot, so you don’t have to worry about being home to receive it! 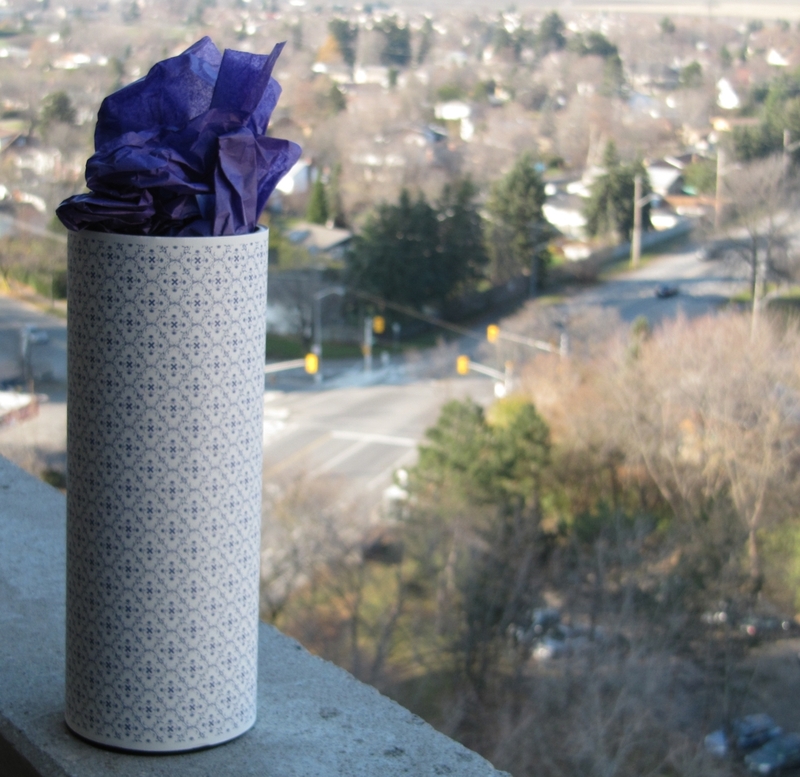 The actual box itself is a cardboard tube wrapped in decorative paper with two hard plastic stoppers as ends. Definitely reusable in my opinion. I’m sure I can find something to store in these! This is a two part sample. 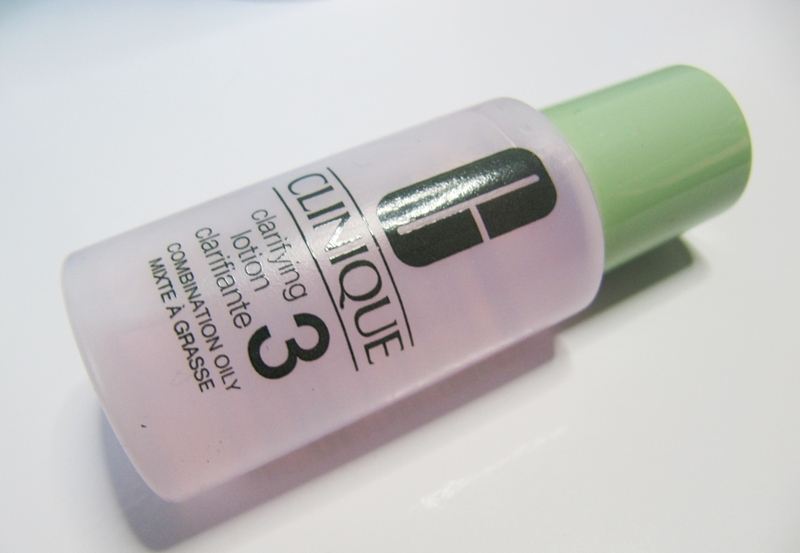 The radiance eye contour comes in a sample size of 3ml. 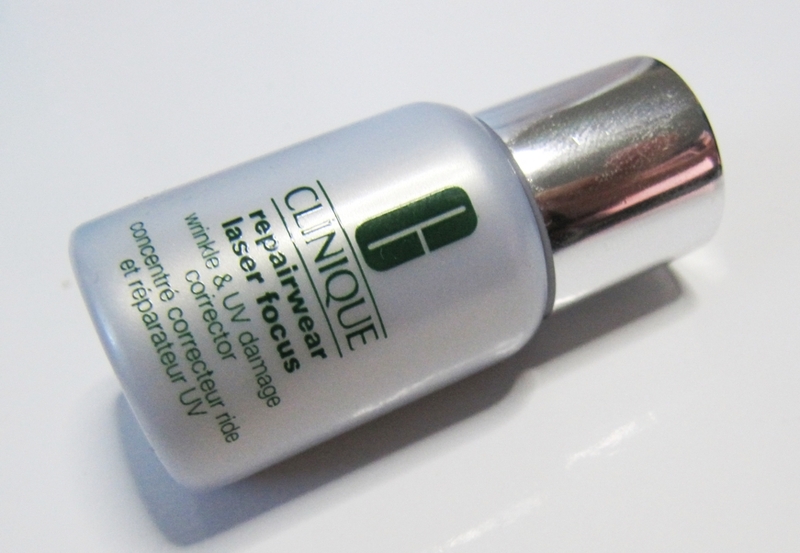 It is designed to correct and brighten the eye contour area. 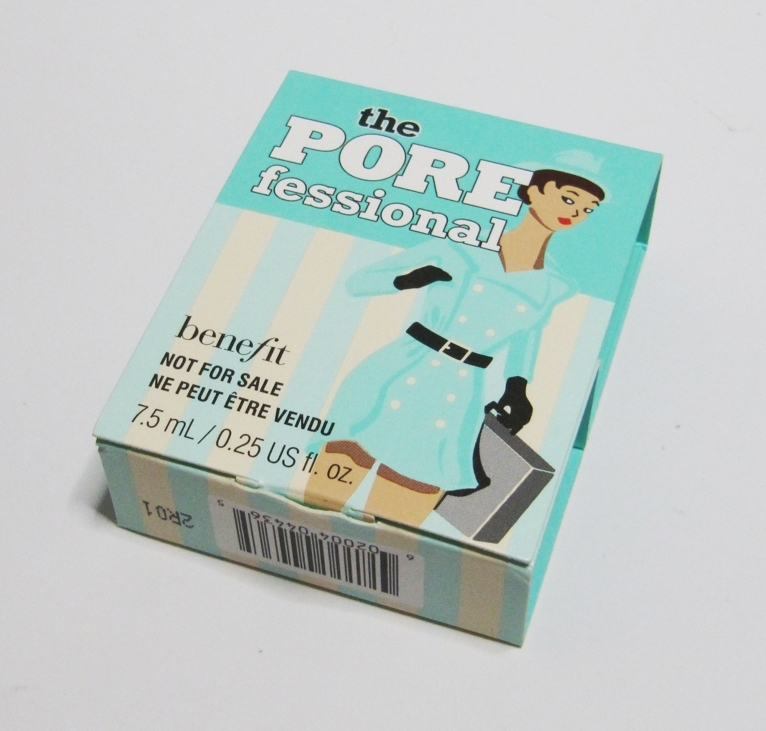 Full size retails at $72.50, which makes this sample valued at $14.50. The ampoules (vials inside the boxes) are an intensive anti-aging regeneration serum for all skin types (to be applied to face and neck after cleansing). These two samples (2ml total) are valued at $16.86 given that 7ml retails for $59.00. 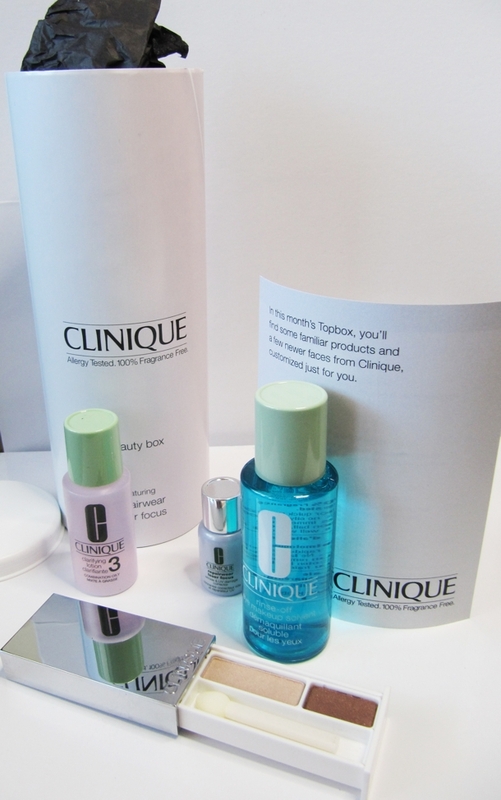 This sample set is great value, but I need to actually use it in order to benefit! 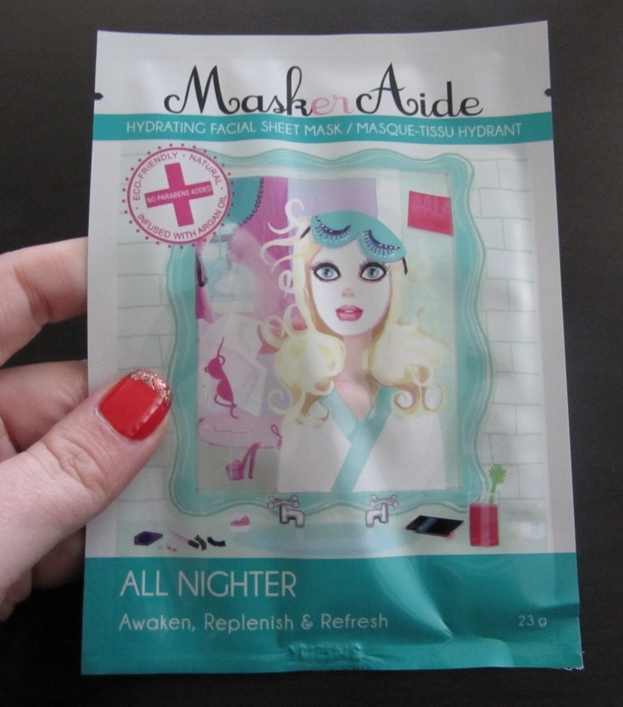 Hydrating Facial Sheet Mask. 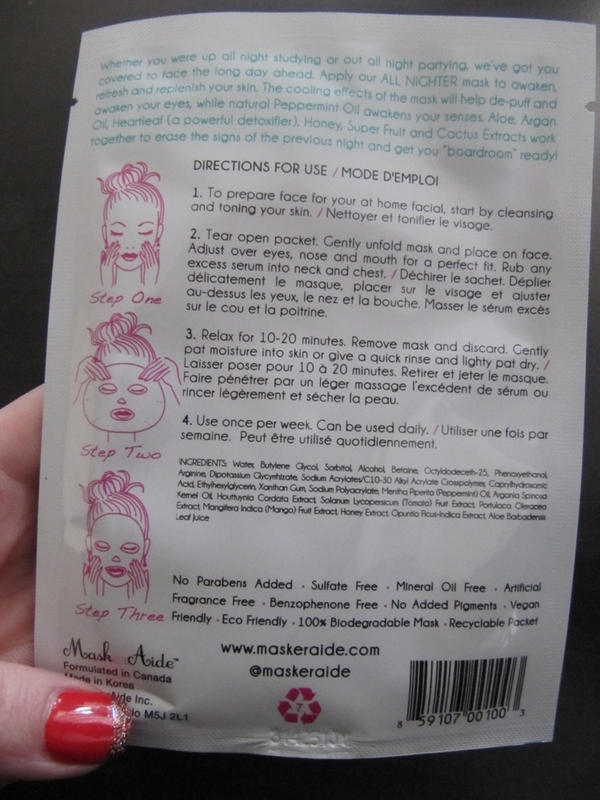 Full size sample, retails for $4.99/mask. This, I will absolutely be using and am excited to try out! 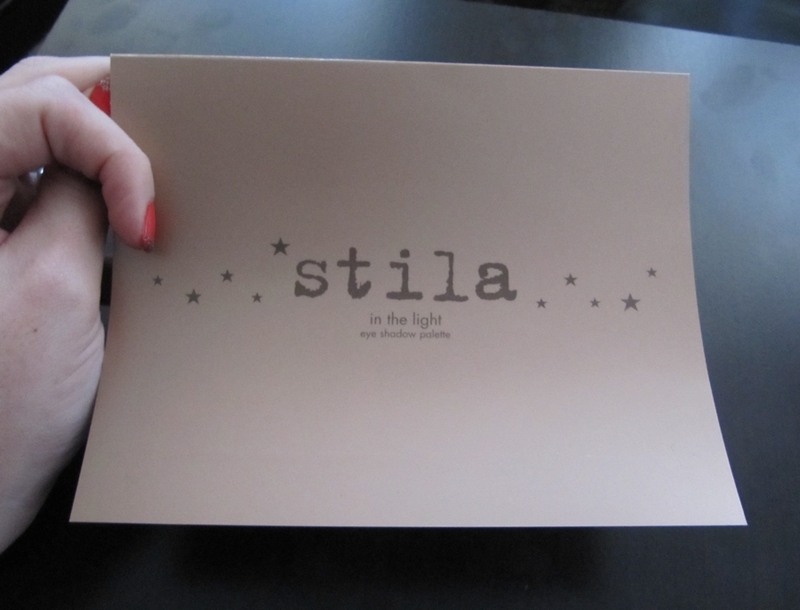 This paper palette features 10 different shades by Stila from their “in the light” palette. 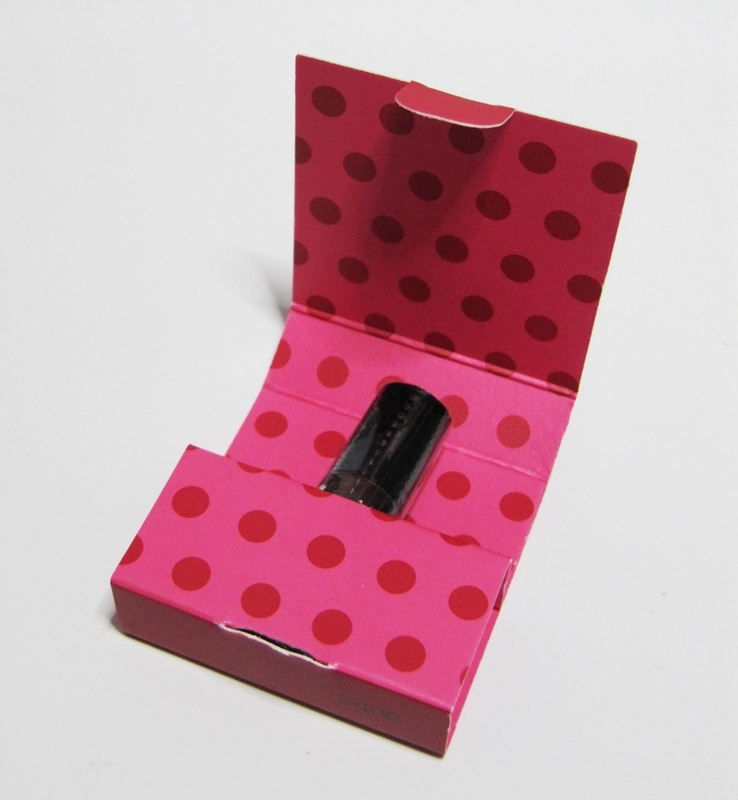 The full size product is 14g, sells for $50.00 CAD and comes with a full size eye liner. There is no measurement anywhere on this sample pertaining to weight or volume, so it is impossible for a value to be calculated. 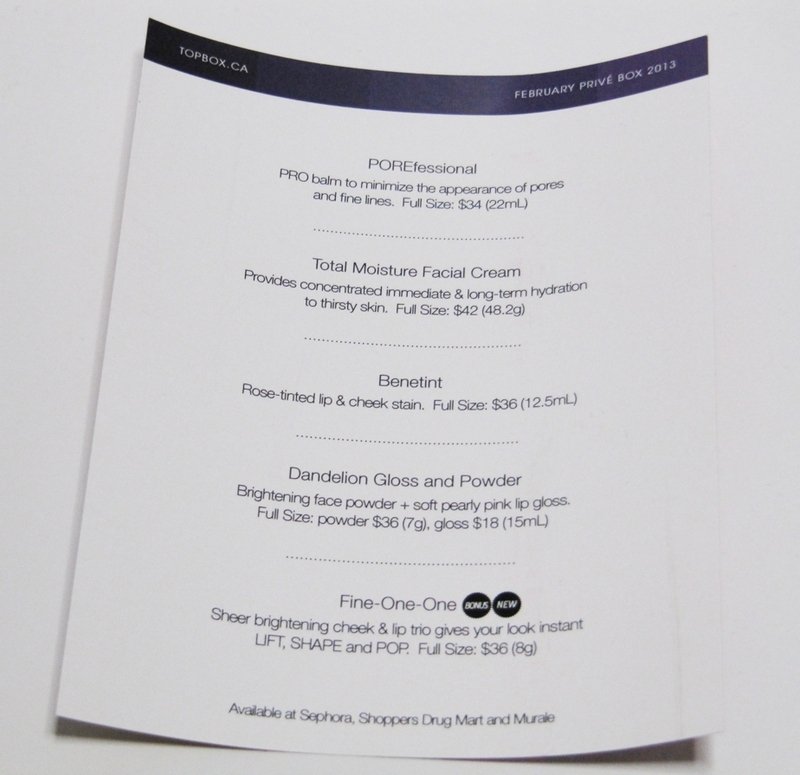 The full size product retails for $34.00 which gives this sample an estimated value of $5.67. I am personally currently in love with my Lancome “Pure Focus” Facial Scrub, but am sure when I run out, I will give this a try…mostly because I love using up product I have laying around. I try not to be overly wasteful. I’ve got to say that I was a little disappointed, after the big long wait. 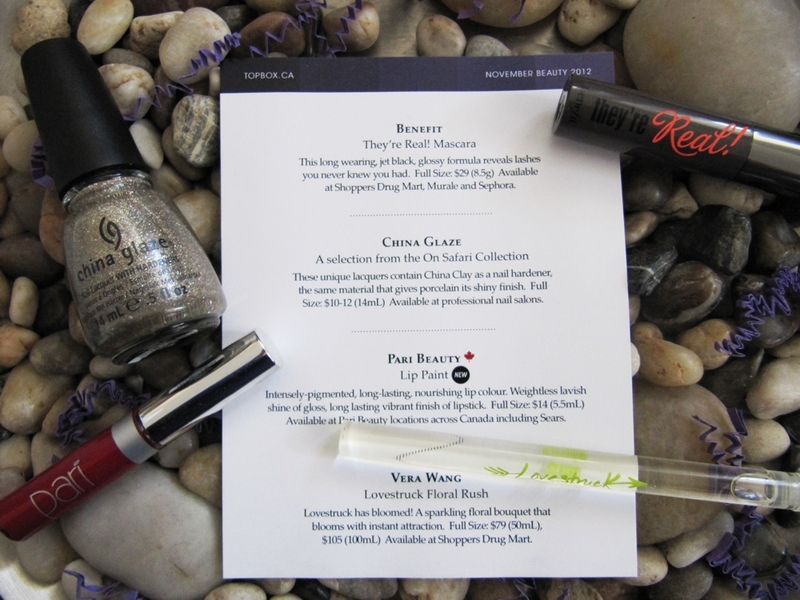 I know with beauty boxes like this, that you usually get some things you wouldn’t normally pick out (that is part of the fun! ), but generally speaking, you should get one thing you are super excited about as soon as you lay eyes on it…I can’t say that I did. I was all pumped up after months of hype and was kind of let down. 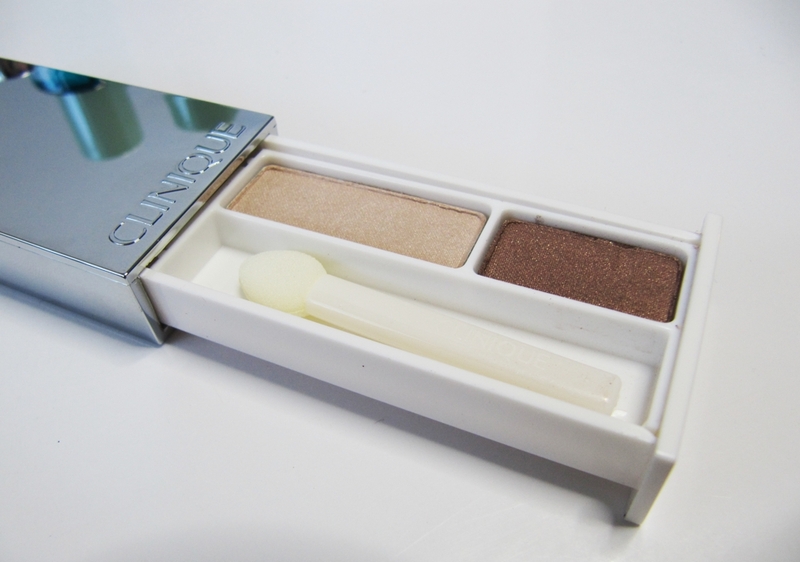 But who knows, perhaps I will fall in love with one of the skin care products… The Stila eye shadow palette was the biggest disappointment for me. 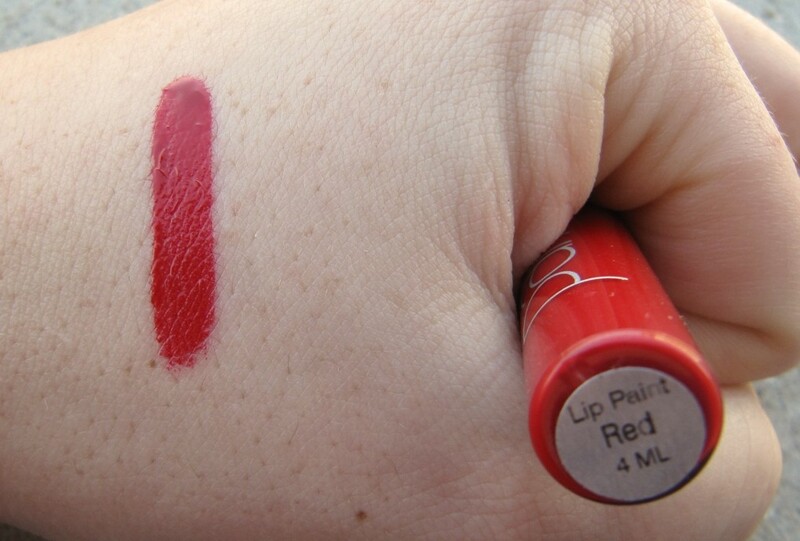 It’s cool that you can try multiple shades, but this sample isn’t anything better than what you might get in a magazine or free from Sephora. I certainly won’t be cancelling my Topbox, I want to stick with it for a few months, but I am definitely hoping that November has a better showing than October. Are any of you receiving beauty boxes from Topbox already? 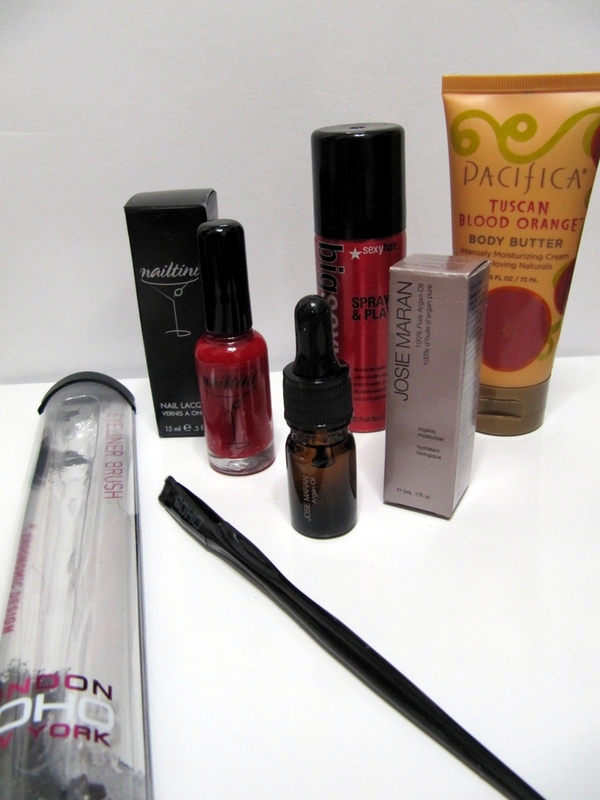 What did you think of your October Topbox? Did you receive different products than I did?